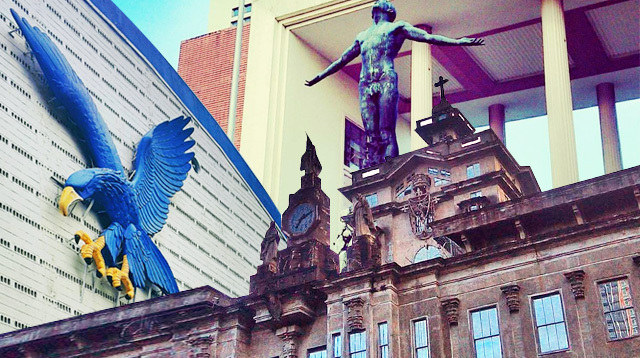 We asked students from different Filipino universities to share the funniest misconceptions they've heard about their school. Can you guess which colleges they come from? Bawal pikon! 1. "Sobrang boring ng mga tao diyan." IDK, but people often judge girls who come from private all-girls schools to be a bunch of prudes (or lesbians, LOL). Another stereotype we've all heard? That kolehiyalas are malandi. Not true! You can't judge the entire university based on that ONE girl who stole your boyfriend. Bitter mo, ha. 2. "Puro porma lang 'yan, di naman nag-aaral." Some students can be stylish AND smart. What's so wrong about looking fab while ~*trying*~ to ace that Algeb1 exam anyway? 3. "Parati silang naka-pambahay." We value our studies more than anything else. We sleep late and wake up early. We have no time for a good #ootd. But trust us, we can werq it when it counts! 4. "Lol, tawag sa kanila 'The University Ocean Park.'" Yeah, you know those universities and schools that are notorious for canceling classes because of constant flooding during the rainy season? A couple of things we want to clarify: 1. We do not ride jet skis going to school; 2. We also do not have an extensive collection of rain boots; 3. Not all of us are fantastic swimmers. 5. "Law school lang maganda diyan." NOT. It’s nice that people recognize your school's forte, but it's not the ONLY good thing about it. Magaling rin naman kami sa business! Sa accountancy! Sa engineering! Ang dami kaya! 6. "All they do is organize rallies." Para sa ekonomiya. PAK. 7. "Naliligo pa kaya sila?" I bet we even smell better than you. 8. "Ah, that's the school you go to if you fail [insert Sister School's name]." WHY WHY WHY WHY DO PEOPLE SAY THIS. 9. "Lahat ng tao diyan conyo." Deins dude. You're just making us all gago.